OAKLAND, CA--(Marketwire - March 9, 2011) - -- Propel Fuels (www.propelfuels.com), a leading retailer of clean, renewable fuels, on Tuesday March 8, hosted Judith Canales, Administrator for Rural Business and Cooperative Programs for the U.S. Department of Agriculture (USDA), at the company's fueling station in Oakland to promote the positive economic and environmental impacts of expanding renewable fuel infrastructure in the United States. Canales' visit highlights the USDA's plan to fund the build-out of 10,000 renewable fuel pumps across the nation in the next five years; promoting rural economies, strengthening domestic energy security, and reducing carbon emissions. Propel is expanding its network of Clean Fuel Points to dramatically increase the availability and convenience of E85 Flex Fuel and biodiesel to the 20 million renewable fuel-ready vehicles on America's roads today. "Propel shares the USDA's vision for quickly increasing consumer access to renewable fuels in order to reduce our nation's dependence on foreign oil, boost local economies, and reduce emissions," said Jim Iacoponi, Vice President of Operations of Propel. "Through a partnership between private investment and public funds, Propel will continue to build the critical link between California's drivers and the next generation of fuels." In late 2010, U.S. Secretary of Agriculture Tom Vilsack announced the USDA's plan to help fund the installation of 10,000 renewable fuel pumps across the nation within the next five years. This plan, along with other departmental efforts, aim to support the further development of the domestic renewable fuels industry, creating jobs and economic growth, primarily in rural America, but to the benefit of all of America. The USDA will look to partner with private sector infrastructure providers in order to quickly and efficiently roll out the 10,000-pump plan in coming years. "The USDA is committed to helping improve the economy and quality of life in rural America and we believe a strong renewable fuels industry, including convenient access to these fuels, is critical to this goal," said Canales. Propel's stations are frequented by California's greenest fleets including the California Department of Transportation (Caltrans) who showcased vehicles at today's event. In addition to infrastructure, Propel's education and outreach programs empower consumers and fleets to make the move to renewable fuels. Adoption of these fuels can provide immediate and significant CO2 reductions helping achieve California's ambitious emission reduction goals. Propel builds, owns and operates a network of Clean Fuel Points -- green-built, self-serve filling stations providing convenient access to clean, American, renewable fuels. The company offers drivers and fleets a cleaner fuel choice that reduces carbon emissions, creates jobs and lowers America's dependency on foreign oil. Propel has also developed CleanDrive™, the nation's first integrated carbon emission reduction tracking platform. Propel operates a growing network of Clean Fuel Points in California and Washington State. More information is available at www.propelfuels.com. 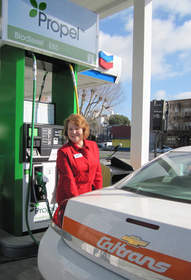 USDA Administrator for Rural Business and Cooperative Programs Judith Canales fills a Caltrans vehicle at a Propel Fuels renewable fuels station in Oakland, CA.